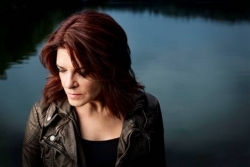 The River & The Thread, Rosanne Cash’s first album in more than four years, will be released on January 14, 2014. Cash wrote the album’s 11 original songs with her longtime collaborator (and husband) John Leventhal, who also served as producer, arranger and guitarist. See below for track listing. On December 5, Cash will begin a three-day residency at the Library of Congress in Washington, DC. Events will include a concert, a round robin with Leventhal, Crowell, Cory Chisel and Amy Helm and a conversation with Natasha Trethewey, U.S. Poet Laureate.